The Nardvark: Those four little words that every teacher says and every student dreads: "In Your Own Words"
Those four little words that every teacher says and every student dreads: "In Your Own Words"
If your teacher sends you home to do an essay on one of the works you have read, the easiest thing to do is find a good, reliable source of information and copy and paste it into your word processor, throw your name on the bottom, and voila! An excellent essay! Sorry to say, teachers can see right through this. For one thing, chances are your teacher has already read the Sparksnotes you're copying from. For another, even if you're copying something fairly obscure, your teacher can likely recognize the difference between your writing style and an actual professional writer's style. If your teacher so much as suspects that you might have copied and pasted even part of your essay, there is software available for him or her to find the original source. 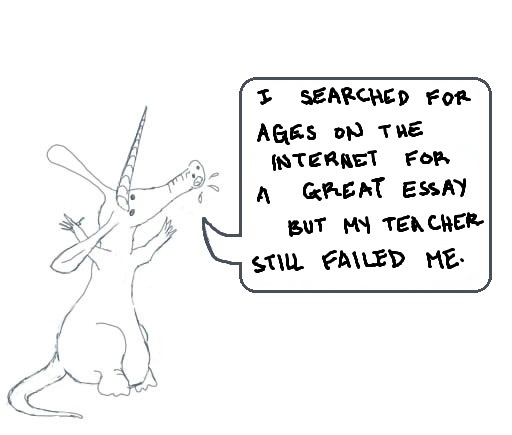 And finally, even the most amazing essay or website you can find on the internet will probably not fulfill the requirements of your assignment - especially for IB students! So.... you can't fool your teacher. But even if you can fool your teacher, stop and think a moment about why your teacher assigned you this essay. Is it because your teacher is a sadistic jerk who loves to think of his students up all night slaving over a hot computer while he is watching TV and playing Playstation? Is it because your teacher is a masochistic weirdo who just loves spending all his free time grading papers? ACTUALLY, and this may come as a shock to you, your teacher gives you homework because your teacher wants you to learn something. Ok, so you've resigned yourself to writing an essay "In Your Own Words", and perhaps you'll even learn something along the way. But how? One mistake that a lot of schools make is to demand that students write essays in their own words, some schools even going so far as to make plagiarism illegal, but then not actually teach you how! That's where the Nerdvark comes in. The Nerdvark has come up with a simple process for taking something that you can find online and turn it into your own words. 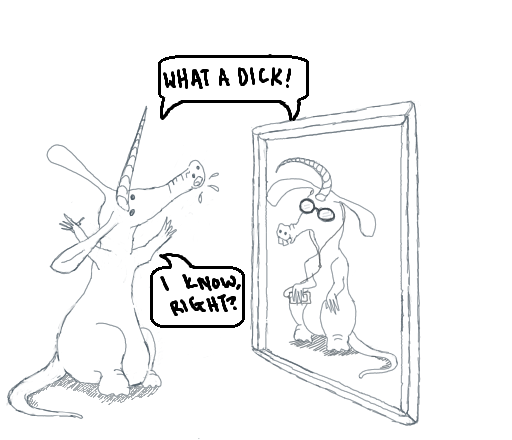 The benevolent Nerdvark has even given an example for you to practice with. How to Write it "In Your Own Words"
Step 1: You found a good, reliable source of information. Copy and paste the whole thing into a Word document. That’s right, do it! Print it off (optional) The example we’re going to be working with is the introduction to William Shakespeare from Wikipedia: http://en.wikipedia.org/wiki/William_shakespeare. Step 3: Make headings on your notes page, according to the questions you want to answer with your research. For our example, you want to find out WHO Shakespeare was, WHAT he did, etc. The words “Who” and “What” are good headings. Step 4: Read your source again, this time highlighting the keywords in each sentence. Keywords are the ones that will answer your questions, the questions you wrote as headings. Step 5: Copy all the keywords as bullet points under the correct headings. Step 6: Close or put away your original source. Step 7: Repeat steps 1 through 6 until you have taken notes from all your sources. 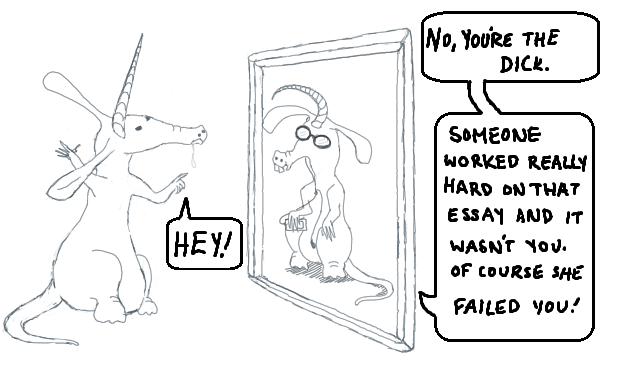 Step 8: Write your essay by looking only at the notes you made. Expand the headings into more detailed headings or into topic sentences. Write supporting details underneath, in sentences you make up (= in your own words), and using the keywords. William Shakespeare wrote 38 plays, 154 sonnets, two long narrative poems, and many other poems, too. His plays are so famous that they have been translated into a plethora of other languages, and they are performed more often than any other plays in the history of the world. Obviously, this is only a small part of an essay about William Shakespeare. Your teacher might, for example, ask you to write about the context of one of his plays. This might be the introduction to such an essay. You can use this method to put other people's ideas into your own writing about ANYTHING - poetry commentary, comparison of two works, research essay, etc, and it can be in combination with information your teacher has given you, information in a text, and/or notes you took in class. But it is important, especially if you are an IB student, to include your own ideas, too. For more on doing research, check out one of The Nerdvark's favourite websites, Owl Purdue: http://owl.english.purdue.edu/owl/section/2/8/. Check the next post to see an example of an awesome essay that The Nerdvark wrote about "The Heaven of Animals," a poem by James Dickey used on a past IB English A1 Paper 1 - Commentary. And meet the real nerd at www.kiborrowman.net.